Sermon - Fly! Be Free! These Roman Christians were united with Jesus Christ, united in Jesus Christ and all because of Jesus Christ alone. How could this be? Entirely due to the twin wellsprings of God’s grace and mercy. And so do we, as all Christians do down through time! In these three chapters, Romans 5-8, Paul is explaining about life under grace – life for all those who claim Jesus to be their Master, their Lord and their God – having responded to God’s free offer! Here in Romans 5-8, Paul shows from 8 different angles or lenses about life for all those who claim to be a Christian disciple – somebody who has decided to follow Jesus. It’s like he is creating this fabulous stained glass window or a tapestry about life for the Christian believer who is now under grace and has Jesus as their master and Lord. What was happening here in Chapter 6? In this section of Romans, Paul wants the believers in Rome to know, understand, recognize and comprehend all that living under grace encompasses. Paul knows that right thinking leads to right living. Paul is writing basic doctrine to this group of believers in Rome. There are 3 possible scenarios in Paul’s thinking – 2 here in Romans 6 and another in Romans 7! Paul had obviously encountered this thinking before – perhaps even in his own life! Informing them of what they were in the past! Informing them of what they are now! Informing them of what they are to do in the future! And why all this, Paul? Informing them about Jesus! Application - What about us? You have heard of the X-factor! Well today we have the WOW Factor! As I look through the Bible and in the Old Testament, I read about how the world fell out of a living and dynamic relationship with God! But I also read how a Messiah, a saviour or rescuer if you like, was to be sent by God, in order to restore the world back into that intimate, dynamic and living relationship with God! I read the four Gospels in the New Testament and I see this Messiah-Saviour as the God-man, Jesus Christ. As I do so, I get a WOW factor about him. Many people in the Bible did also, during his public ministry and even after his death! Here is once such person! Jesus' divinity, humanity, death, resurrection, supremacy, creator, leader, eternal, sustainer, power, authority, reconciler, peace-maker and peace-giver! WOW! 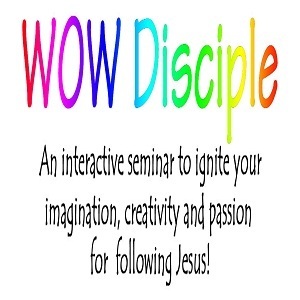 What would your Jesus WOW factor include? Let me share with you some thoughts on the WOW Factor of Jesus and me. What is this WOW factor I get about Jesus Christ? Who is my Jesus? There are many WOW factors I get, but we don't have time for that tonight, you might be thankful to hear! You will have to come back next week for more! So tonight, 7 WOW factors of Jesus! Then the Jesus I see is full of majesty and awe! He is not simply a king with a crown on his head. He is the King of all Kings and the Lord of Lords! This Jesus Christ did not decay in the grave - He overcame death in the grave and was raised again majestically! As Paul said about Jesus' resurrection, in that passage from Colossians, Jesus is "the first-born from among the dead". Paul writes later in Colossians 2v3, that "in Jesus Christ, all the majestic treasures of wisdom and knowledge are hidden." Jesus Christ the King of Kings and Lord of Lords, who with unparalleled majesty, is the head of His body, the church. If Jesus did not rise from the dead, the church would not be in existence 2000 years later, let alone 2 years after his death. Jesus' majesty meaning I can depend upon Him for all matters of life. Next I go to look into his eyes - his tender eyes! Jesus looks upon people with love, adoration, justice and tenderness. Eyes filled with mercy, grace, love and compassion. Eyes that fill with rage at injustice and oppression! His penetrating eyes that can separate flesh and spirit! This Jesus is kind and sympathetic - his look of love on a world that is separated from God, and a world He is calling back into an active relationship with God. Jesus' tenderness which means I can run to Him for comfort because He sees what I am going through. Then there is Jesus the wise man! When Jesus spoke words, people were amazed! They were astounded that He spoke with elegance and yet with authority. They had never heard anyone speak like He did - with both grace and authority. The same is true today, if we are listening. That is why we read the Bible to find out what He would say to us. That is why we seek to hear Him speak to us and why we speak to Him. 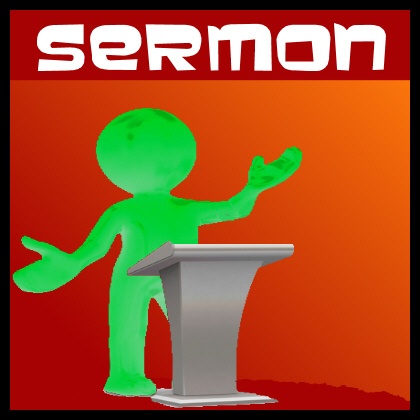 That is why preaching is to be seen as an act of worship - by both the preacher and the listener! Jesus' wisdom meaning I can ask Him for advice and seek His imagination to solve problems! Jesus is strong enough and capable enough, to carry any burden that is laid upon Him. Jesus Christ gives a solid and sure foundation for all aspects of life, which will not fall or be destroyed. Indeed Jesus Christ will never fall or decay such is His imperishability as the everlasting God. Jesus Christ is solid, dependable and strong; nobody and nothing can stand against Him. Jesus' strength means I can go to Him for protection and strength when I am weak and knowing He will supply my needs. Finally, at least for now, this Jesus oozes loveliness! Jesus is altogether lovely and lovely altogether! Jesus is beyond compare for the things He has done and the things He will do. Jesus Christ is altogether lovely in regard to his person, humanity, birth, life, ministry, death, resurrection, ascension, exultation, glorification, grace, protection, tenderness, power, wisdom, vengeance, judgment, majesty, redemption and pardon! Jesus' loveliness means I can have His incomparable joy when I feel defeated and dejected. That is my Jesus: unique, majestic, tender, wise, strong, and lovely. That is my Jesus, whom I seek to serve and obey in every facet of life, every second of every day. I don't always achieve it, but I know that when I fail, I can ask for forgiveness and He will grant it from His wellspring of gracious mercy. Yet another WOW factor about Jesus Christ. It is this Jesus whom I depend upon and personally know to be totally reliable in every way. When people let me down, turn away from me, discourage me, think wrongly off me, incorrectly assume my motives, this Jesus always picks me up, never turns me away always encourages and embraces me. But so what, you may say! I know those outside the church certainly ask "So what?" All through each day, I know that Jesus has been dependable, going ahead of me! Amazing! This Jesus who died on a Roman cross two thousand years ago was the same Jesus who was raised from the dead, without decay, into newness of life and ascended to the right hand of the Father. WOW! There is only one Saviour for the world. There will never be another because there is no need of another. Despite the bleating of other religions and faiths! Jesus never said, "I am a true vine; a way, a truth and a life". Just as He did not say "I am a shepherd, a door, a light or a bread of life." If He was like that, then He would have no WOW factor at all. No! Jesus is the only way, the only truth and the only life. Jesus is the only great shepherd and the only door to life with God. Jesus is the only light of the world and the only bread of life. Jesus calls everyone to partake of the nourishment and shelter only He can provide. That's our Gospel WOW factor which is unalterable. Sadly only a few respond: "Yes!" Are you one of His followers or are you one of His deniers? Again, I ask you - what would your WOW factor of Jesus include? Oh how Jesus loves us. Jesus! WOW! By now, you may well be asking yourself "What does WOW stand for?" It means "Worthy Of Worship!" Jesus Christ: unique, majestic, tender, wise, strong, and lovely, is most certainly worthy of worship! The Jesus WOW factor involves Jesus being radical and relevant! Even a brief look of the Gospels, will reveal that about him! Some people back then didn't get Jesus, and people still don't get Him two thousand years later! You may well be one of those who don't get what Jesus was about! Whose fault is that? It's not Jesus' fault that people today don't respond to Him! It's partly a result of the church and Christians down through the ages, including today, not following Jesus and being fully committed to Him, obeying His commands as closely as they could or should! That's why my parents thought churches were dangerous places and Christians were simply brainwashed and deluded people. They did not hesitate to tell me that that is what they thought about Christianity! But as a teenager I rebelled against my parents, responded to the call of Jesus Christ, and became a follower of him some 30 years ago! Some say I am still rebellious, but I just don't see it! Another definition for you! The word Christian, means ‘little Jesus'. Did you know that? That's what being a Christian is to be - a little Jesus! As we travel this life we are to be little Jesus' to others. The world out there and this community will know you and I are Jesus' followers, if we are obedient to Him, practically showing love! A love which considers the interests of others before our own self-interest! A love which sees different churches working together and for churches willing to be radical and risk-taking for the sake of the Gospel! Surely we can celebrate our differences and yet work together for the sake of the Gospel? Our ability to love others is borne from a loving God of vast imagination! Even a subtle look at creation will reveal His imagination - even in creation's fallen state! What is more, the solution to most problems is borne from people with imaginations reflecting the imagination of this Jesus! WOW! 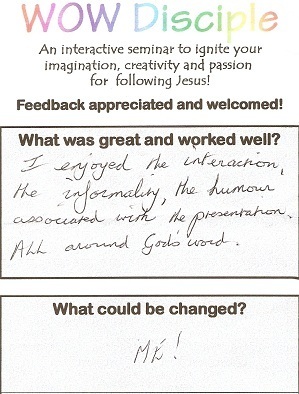 Imagine whole communities transformed for Jesus Christ, having got the WOW factor! Imagine Ringwood, or the place you live, filled with people seeking to know about our Jesus, because we as Christians were sacrificing our time and possessions, just as the early church did in Acts 2, and wanting in every aspect of life to give Jesus the glory and honour that is worthy of His name alone! Is that your vision for this community? Loving God and loving each other just as Jesus commanded would transform our local community! How do you show others that you love this Jesus? You show it by loving and serving others! 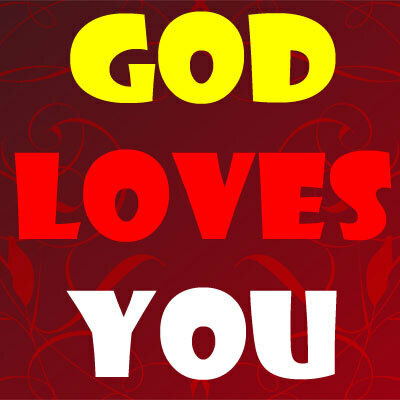 They are the primary ways of showing you love God! It is easiest for us to love our friends. But Jesus commanded that his followers also love their enemies! Now that is very radical and it can be difficult! We see constantly in the media and elsewhere, that regards our enemies, we are to be confrontational or at best to just ignore them! How is it possible to love our enemies? It is only with the help of God and His abundant grace towards us! We depend on the Holy Spirit who lives inside all Christians to empower, transform and guide! To only love those who love you is what is expected by people everywhere as normal behaviour. But if you are a Christian, you are to do more! You are to be seen to love more than other people. You don't have to like others as friends, but you do have to love them as fellow human beings! According to the late John Stott, perhaps the greatest indicator of your love of Jesus Christ is in your giving! Jesus talked about giving quite a lot. Jesus Christ gave everything so that you and I may have life and life in abundance. So by giving generously, you are reflecting that God, through Jesus, has given abundantly to you. And of course, by loving, serving and giving to others, we may just be the answer to people's prayers. How is your giving? Giving generously is not just financial. It could be an email, a letter, a smile, a touch, a kind word or a phone call. These things too are valuable to the recipient, particularly the lonely, isolated, sick, depressed, recovering and oppressed. We are to give generously, but not just to those we like. Just as we are not to love only those we like and get on with. We are commanded to love everybody, including our enemies, those we are ambivalent towards and particularly those who are in need. Our giving of words, gestures, touches, possessions, lives and yes, even money! How does our giving of anything match that of the God we claim to love? Our money, words, talents, gestures, touches, possessions and lives: to be given without expectation of return. That is the essence of grace. Our money, possessions and lives were all given to us by God in the first place! How and what you give is up to your own conscience before God. To not pass them on wisely and freely for the use of others in need is to rob God of glory due His name. To not do that is to engage in a gospel of works and not the gospel of grace. Indeed, the reason most people don't give to those in need, is because they are either selfish or lack the imagination to fulfil those needs. Or is that just me? When those outside the church, in the world, give, they generally give expecting something back. When we Christians give, we are to give as God gives - freely and without expectation of getting anything in return. Now that's radical giving! We, as the church, being little Jesus' are not to emulate the world. Rather, we are to emulate the greatest gift, Jesus Christ, who freely gave all, in the name of love! How is your own WOW factor of Jesus? Whose strength are you using to love, serve and give? Let me ask you another question. Whose strength are you using in order to love, serve and give? If we love, serve and give to others in our own strength then eventually we will get tired of loving, serving and giving. But if we maintain our relationship with Jesus and do it in the power of the Holy Spirit who lives inside us, then our loving, serving and giving will never tire - we will keep on loving, serving and giving because the Spirit's power is inexhaustible. So as you love, serve and give, who are you leaning on for strength and replenishment? When you are tired of loving, serving and giving, ask God to renew your strength! When you lack the imagination to love, serve and give, then ask God to renew your imagination! He will help you! Most problems can be solved with the use of imagination and putting it into practise. Just because you can't help somebody, doesn't mean somebody else cant! That's why we are a church, a body of believers, to help each other and together, envision solutions to the problems being faced - a people of vision! You may have noticed I used only 6 WOW factors when I originally said 7. Here is my seventh - Jesus is coming back! That's the ascended Jesus Christ as portrayed by his friend John! WOW! Are you suffering today with some illness or you are in the middle of a period of grief? We all suffer in some way. I had a stroke back in 2003 and recovered. I still get aches and pains, particularly a very dodgy memory. But one day! One day you and I will have perfect bodies and minds. WOW! And not only that, but this God suffered and died on a cross, so has sympathy for our own suffering while we are in this world! WOW! Jesus is coming back and will do the most extraordinary thing. We read about it in Revelation 21. But for now just verse 4 ‘He will wipe every tear from their eyes. Isn't that just the most amazing verse with a great big WOW factor? Picture it! Jesus Christ taking your face in His scarred hands and He will wipe away your tears - tears of suffering and tears of joy. You will say to yourself, it was all be worth it - the trials, temptations, sufferings and experiences I have had for the sake of Jesus Christ my Master. WOW! So our time is at an end for tonight, how can we conclude? We saw together how Paul had a WOW factor about Jesus Christ! We saw how to me Jesus' WOW factor included his uniqueness, majesty, tenderness, wisdom, strength and loveliness. Then we looked at the WOW factor having an impact on communities; that we Christians are to be as Jesus by loving, serving and giving to others! We saw that by loving, serving and giving using Jesus' strength means that we will never tire of loving, serving and giving to others. Then lastly we glimpsed briefly at that momentous time when Jesus comes back to wipe the tears from those who endure for His sake. WOW! How are your travels with Jesus? It may well be that you are here tonight, feeling desolate, abandoned and lonely. Let the WOW factor of Jesus wrap you like a warm embrace, encompassing you with loving compassion. Or you may well be here and you are feeling tired, drained, burdened and in need of help. Maybe you are struggling to make a major decision and don't know what to do. Allow Jesus to give you the strength to endure! Give the burden to Jesus and let Him take the weight for you. Seek the wisdom of Jesus in making that decision. He will help if you ask. That's all part of the WOW factor of Jesus Christ. You may well be here and you are on fire, fully committed to Jesus and feeling great! Then keep going and keep letting Jesus be your strength, your wisdom and your help. But don't keep it to yourself - that would be selfish! Go to others you know who are in need, regardless of who they are, showing them your WOW factor of Jesus. Go to others, loving, serving and giving just as Jesus loves, serves and gives to you. 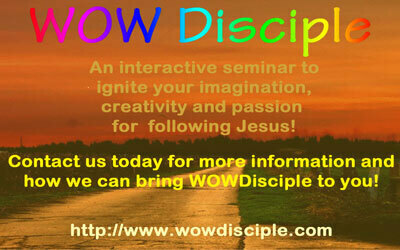 Next week, we will continue to look at the WOW factor of Jesus. But as for those particularly aspects, you will have to come back! We pray together and when Christians pray together, from different nations, different churches and different denominations - that reveals Church unity! Come! Today we are praying especially for peace in this trouble world.